As a technology speaker, I spend a lot of time talking to people at conferences, and I like to have some gizmo to hand folks as a conversation starter. This works out well, because I'm frequently writing a story about or building a project with the device. Physical hardware and one-off gadgets are absolute geek magnets. When I received a tiny color LCD display for Christmas, the idea of a programmable name badge immediately came to mind. An unusual name badge would certainly grab people's attention and could be made reconfigurable, so I could change my message, logo, or graphics as needed or even through sensor inputs. Building and using your own projects adds considerable credibility to your story. I'm also a big fan of Steampunk, and what better way to stand out than to apply that aesthetic to a project? Steampunk encourages lots of creative freedom in the design, and combining Victorian-era elements with modern electronic technology is challenging and just good, clean fun. Here's a rundown of how I built a Steampunk name badge (Figure 1). Feel free to use the design and share your improvements with the DIY/Maker community. Figure 1: Steampunk name badge. The microcontroller I used was a 16MHz, 5V Arduino Pro Mini board from SparkFun. This little powerhouse measures 0.7x1.3 inches and sports a surface mount 328 processor chip. It supports 16 I/O pins; this version of the project didn't need any of the analog pins. You'll need to use an off-board USB breakout board or a 5V FDDI-to-USB cable to program the Pro Mini from your notebook computer. I soldered a six-pin header onto the end of the Pro Mini. The cable plugs right into the header pins. Make sure the black wire matches up to the "BLK" pin on the right (as viewed from the processor side of the board). 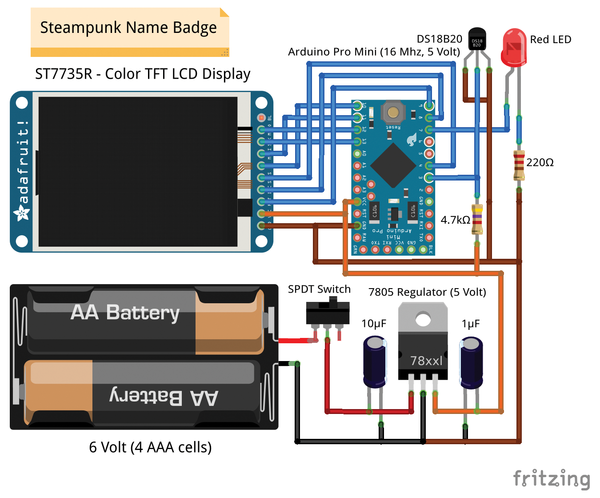 A 7805 voltage regulator supplies the badge with 5V of power from a 6V to 18V input source. I used 3/16-inch brass tubing for the support frame. You'll also need a few tools, including a 15-watt soldering iron, 100/150W soldering gun, needle-nose pliers, diagonal cutters, screwdriver, third-hand clamp, Dremel, small bits, sandpaper, and copper pipe cutter. Most of these tools can be found at hardware stores. The LCD and Pro Mini are bare-board breakout-type modules devoid of headers or pluggable connectors. You can add your own or not, according to your project requirements. Both modules will run on 5V and have on-board voltage regulators. I used an external 7805 voltage regulator module to bring the voltage down to 5V and allow for future expansion with varying input values, additional sensors, and maybe even some servos. I also chose to use four regular AAA batteries totaling 6V. A fresh set of batteries are good for about a day of conference action. The external regulator supplies up to about 1.5A of 5V power from 6V to 18V of input. 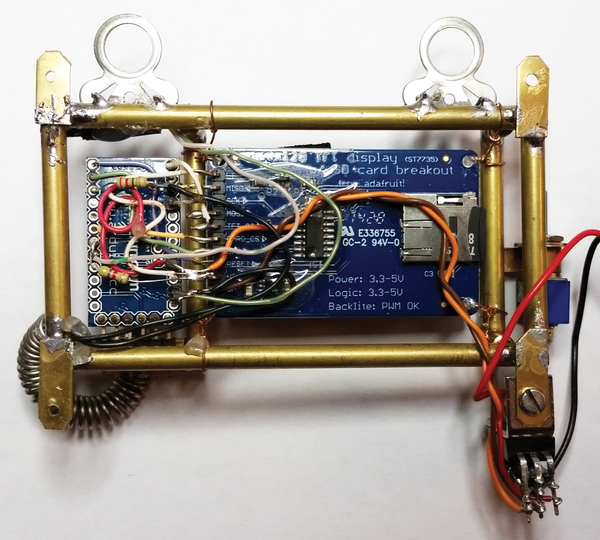 A breadboard definitely didn't fit the Steampunk theme, so I simply hard-wired the LCD and Pro Mini together with all the wires running on the bottom of the boards (Figure 2). Figure 2: The reverse side of the badge. The LCD display and Pro Mini are roughly the same width. Mounting the Pro Mini vertically next to the LCD connections minimized wiring issues. I soldered a header onto the LCD for breadboard use and initial testing, and instead of de-soldering the header, it was easier simply to bend the pins over and solder them to individual matching bent pins on the Pro Mini. Other connections were bridged with 22-gauge solid-core copper wire, salvaged from lengths of CAT 5 cable. The wires are easy to work with and are perfect for low-current-demand pseudo-prototyping projects like this (Figure 3). Figure 3: Breadboard view of the circuit. 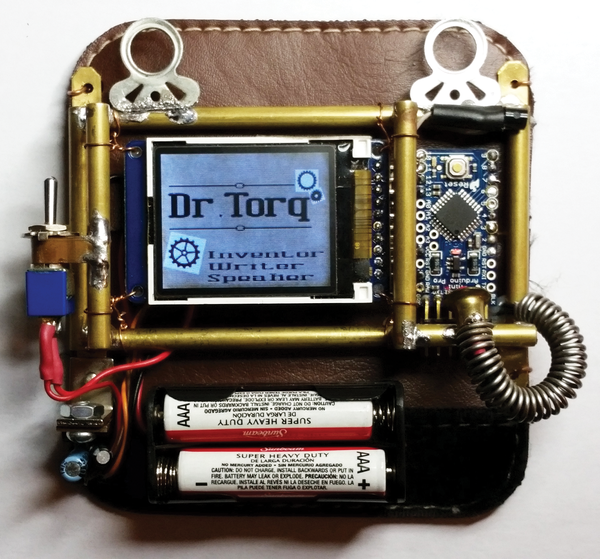 The doctor upgrades a conference slide projection apparatus and adds a retro-clicker with some Python code to keep his talks moving forward. Kdenlive is an easy-to-use Linux video editor with a ton of features that let you create a short video for your Rasp Pi wearable. Get a tiny color display working on a Raspberry Pi, so you can show your own movies. Nintendo's Game Boy was all the rage in the 1990s. Now you can use your Raspberry Pi to breathe life into those classic games.